Yesterday was packed full of fun, so the TV Week That Was had to be delayed until a Monday night. But here we are! Last night saw the Royal Rumble PPV on the WWE Network. 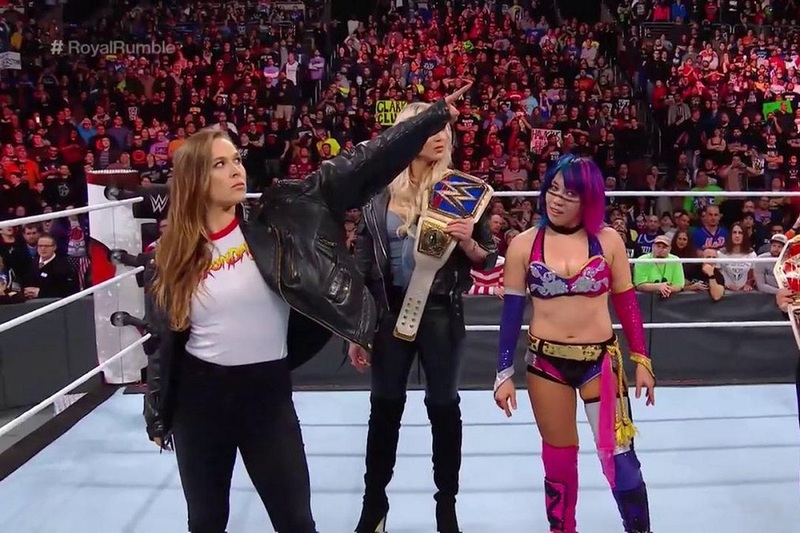 The first ever all-female Royal Rumble main evented the show with “The Empress of Tomorrow” Asuka winning. The male version was won by Smackdown star Shinsuke Nakamura. Shinsuke then announced that he would be challenging WWE Champion A.J. Styles at Wrestlemania, which is a huge match. Other major winners last night included The Usos retaining their Smackdown Tag Team Championship, The Bar regaining the RAW Tag Team Championship by defeated Seth Rollins and Jason Jordon, A.J. Styles defeated Kevin Owens and Sami Zayn in an handicap match to retain the WWE Championship, and Brock Lesnar pinned Kane in the triple Threat match with Kane and Braun Strowman. Then, at the end of the night, a surprise came out from the back to make a challenge for Wrestlemania. Rhonda Rousey came out and pointed to the Wrestlemania sign. Social media then indicated that Rousey had signed full time with the WWE. The women main evented the PPV and this was a great way to go off the air. We are officially on the Road to Wrestlemania. There was more wrestling this week as Monday Night RAW turned 25 years old and presented its bog show with a lot of nostalgia and not much else. Stone Cold Steve Austin came back to stun Vince McMahon once again. The APA played poker. The Undertaker made an appearance. DX made an appearance. Match wise there was not that much. Miz defeated Roman Reigns and became the Intercontinental Championship once again. Honestly, the show was a bit lackluster for how big the show was promoted to be. Thankfully the Royal Rumble delivered more. And delivering even more after that was NXT Takeover: Philadelphia. Saturday night prior to a big WWE PPV brings us the epic NXT card. We had a brilliant Extreme Rules match between Adam Cole (BABEEEE) and Alastair Black, won by Black. Just as people were getting ready to dub this the match of the night, out came NXT Champion Andrade “Cien” Almas took on Johnny “Johnny Wrestling” Gargano. This 31 minute match was one of the best NXT matches of all time and is easily your January leader for match of the year. It was simple epic. Almas held off Gargano and defeated him to retain his title. Netflix dropped the first episode of David Letterman’s new show, My Next Guest Needs No Introduction with David Letterman. Letterman, the iconic late night TV show host, spent 50 minutes interviewing former President Barack Obama. Letterman had not missed a step as he was extremely interesting discussing all sorts of specifics with President Obama. The gigantic beard on Letterman’s face is hard to take your eyes off of, admittedly, but these two had me fascinated the entire time Next up is George Clooney. I gave Flash another chance this week, and I liked what I saw more than I did with the Trial of Flash. Bill Goldberg guest starred as a felon who Barry met and bonded with. Apparently, Goldberg was someone who owed a favor to Barry’s father. However, the best part of the episode was the elevation of Ralph Digby from joke sidekick to full fledged super hero. The Elongated Man, which turns out to be a better name than Stretchy Man, was the best part of the show. 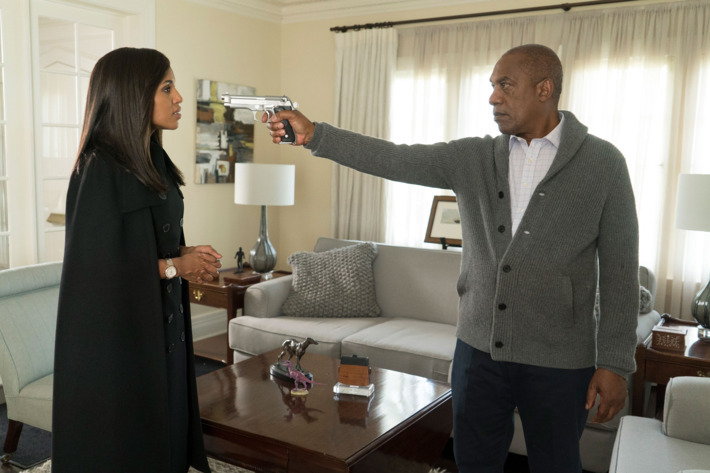 Scandal revealed that, as expected, Rowan did not shoot Quinn after all. She has given birth to her son and fought her way out of the basement being. I was pretty disappointed by this as it just felt like the typical bait and switch and it underplays the entire emotions from last week’s solid episode. There was a lot of flashback and showing us scenes that we had already seen, but maybe just slightly in a different perspective. These characters are just lost to me at this point. Olivia is gone dark side without chance to be saved, in my opinion. Rowan is well past due time for a bullet in his head. 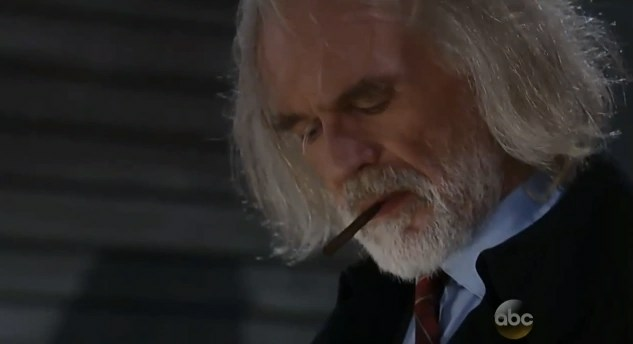 General Hospital brought back one of their most compelling villains of all time and unleashed him on Port Charles for a few weeks. Cesar Faison, played by Anders Hove, showed us why he is continually brought back. He was an amazingly intense and vicious character, terrorizing Anna Devane, Lulu Spencer, Maxie and, his surprise son, Nathan. Cesar shot Nathan before he knew who he was. Thankfully, Jason was there to intercept Faison, who had taken Carly hostage. Faison told Jason that he couldn’t make the shot… which Jason did, of course. Jason wants answers about his twin brother that, apparently, Faison had something to do with it. Disturbing was on display on the X-Files this week as we saw young Mulder on a couch enjoying his Twilight Zone was not. The episode was actually quite a funny one, but this shot of Mulder as a child watching TV was just about as silly as anything you will see on TV. Agents of SHIELD is great each week. This week was a dramatic and emotional one as Robin, the young girl seer from the past, was now an old woman, who has secrets to reveal. One of those was that May raised her after something happened to her mother. When Robin is killed, there is nary a dry eye int he house. Sinara also comes down to the surface of the destroyed planet (was it really Quake? not sure)and winds up biting the big one. Plus, Mack, Yo Yo and Flint’s rebellion against Kasius seems to be going well, but I guess Kasius still has a seer. Oh, and by the way, he brought back to life Tess. 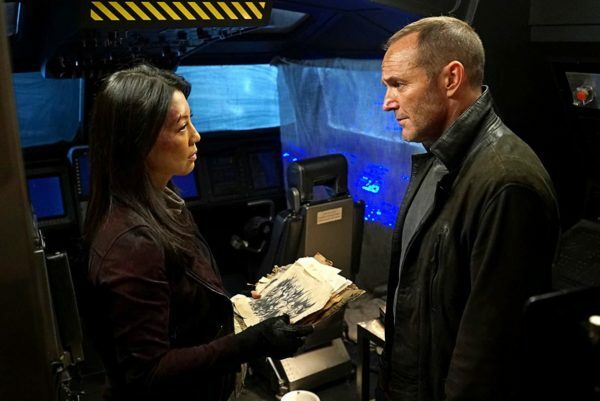 Agents of Shield is driving toward their 100th episode and it is a joy-ride each week. There is more I could write, but I am tired and getting ready to go to bed. So I will skip Speechless, Child Support (new game show), Match Game, Black Lightning (a good 2nd episode), How to Get Away with Murder, the Schmoedown Awards (have a blog post about that) or Movie Fights Live. Next week: The new season of Movie Trivia Schmoedown starts on Friday with a triple threat #1 contenders match. I have to catch back up with Riverdale. Oh, and there is a little game called the Super Bowl.